Pretty neat! 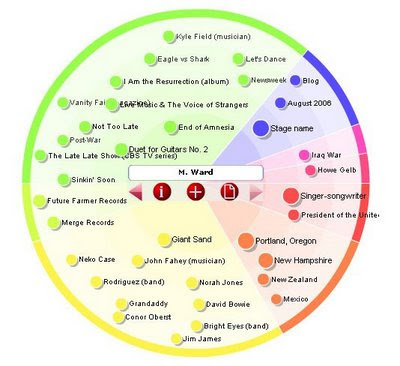 Of course you could just look up M Ward on Wikipedia or type his name into Google but what I like about this tool is the snapshot of keywords it gives you without having to read through pages of text, it's quick and easy. Did you know M Ward sang backing vocals on one of Norah Jones' albums? I didn't! All information that could be handy if you were about to interview the guy or write a piece on him and it took me all of five seconds to find this fact out. There's lots to play with on this site, you have a certain amount of control over the verbosity of the search results, too verbose and the picture starts to look messy and my eyesight or screen just isn't good enough for that! Don't expect a miracle! - If the band or artists you are checking out haven't got much Internet presence and you're the only one who's heard of them then don't expect this tool to be able to magic up results. 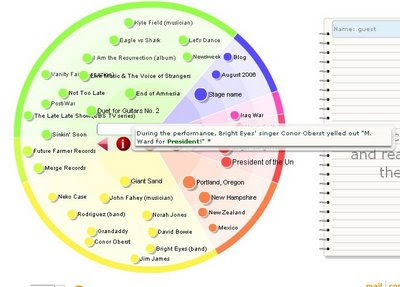 Although I can see the potential eyePlorer has as a useful music research tool I should add it can also be used to research any keywords and is not limited to music in any way whatsoever. Have a play and tell me what you think. Seems like an interesting tool. Wow, this is a really good idea, and a great concept! Thanks for the update - nice post.